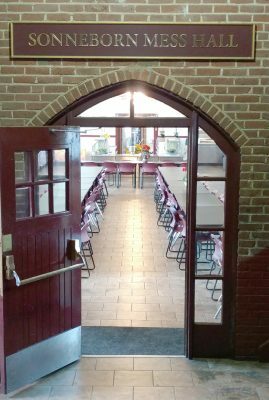 Sonneborn Mess Hall is maintained by Fishburne Military School and operated by Marquis Services, Inc. Because Marquis is a small, family-owned, Virginia-based company, the Food Services Director at FMS has the flexibility to design the menu to cater to the tastes of our Cadet Corps. Ingredients are locally sourced whenever possible and Marquis strives to keep the menu fresh, fun and nutritious. Special events such as Chinese New Year, Fourth of July picnics, Awards Ceremony steak dinners, Mardis Gras and more are celebrated festively with special decorations as well as healthy and delicious fare. Every day we use as many fresh vegetables as possible (depending upon season). We love to use fresh herbs! We like our meat fresh, not frozen! We like to make our food from scratch! Made-to-Order Deli Bar with assorted breads and wraps – including ham, turkey, beef, (none of these cold cuts have nitrates), peanut butter, butter, grape jelly, strawberry jam, apple butter, hummus, egg salad, pimento cheese, provolone, Swiss, American, pepper jack, and American white; with lettuce tomato, onion, dressings and pickles to choose from. Delicious dessert – such as brownies, puddings, ice cream, cakes.